How do I add links to my social accounts? Can I add a background to my feed? How do I add games to my games library? How do I change the notification and messaging sounds? How do I check-in to a game? How do I add BoomTown as a Twitch Component or Panel? How do I install BoomTown? In your profile page, click the + button to show your Linked Services. 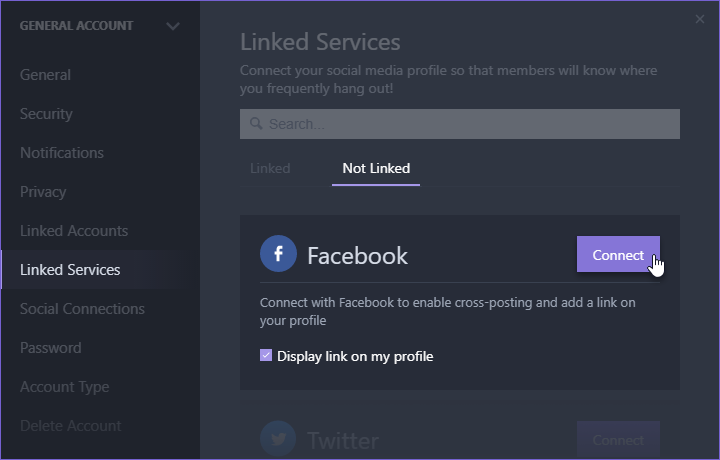 Go to the Not Linked tab and click Connect from the current list of social accounts that you want add (you may need to scroll down or use the search bar to find the one you want).